The first-ever National Logistics and Transport Excellence Awards 2018 organised by The Chartered Institute of Logistics and Transport (CILT) Sri Lanka will be held at The Kingsbury Hotel, Colombo, on 17 July. The Logistics and Transport industry is a vital component of the Sri Lankan economy and, as the leading international professional body for the industry, CILT Sri Lanka wishes to recognise and celebrate the exceptional and valuable contributions that organisations and individuals have made to take the industry to new heights thereby uplifting the national economy. National Logistics and Transport Excellence Awards conducted by CILT Sri Lanka have two categories, namely individual and corporate. The award for the individual category will be a lifetime achievement award, ‘CILT Sri Lanka Pinnacle Award’ bestowed on an eminent individual who has an outstanding track record in the Logistics and Transport industry. 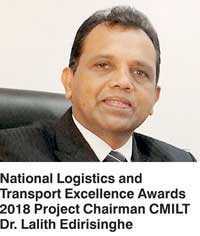 Similarly, there will be five awards in the corporate category, ‘National Logistics and Transport Excellence Awards’ to recognise the most outstanding organisations in the industry with platinum, gold, silver, bronze and merit.Prime Minister Ranil Wickremesinghe will attend the National Logistics and Transport Excellence Awards 2018 as the Chief Guest. Minister of Ports and Shipping Mahinda Samarasinghe and Minister of Transport and Civil Aviation Nimal Siripala de Silva will attend as guests of honour along with the CILT International President Elect Dr. Dato’ Ts Abd Radzak Abd Malek, FCILT. Prof. Lakshman Watawala, Preethi Jayawardena, Sanath Manatunge, Adrian Perera, Rajeeva Bandaranaike, Karthik Elangovan and Lalith Wijetunga served as the eminent independent panel of judges.